Maybelline is on a roll with the new launches right now. First, the Velvet matte lip colors, then the super fresh compact, then the new Candy baby lips and lastly the Color show Gold Digger collection! I have already introduced you to the golddigger nail polishes and will soon be telling you more about the super fresh compact. But now, it’s time for the velvet matte lip creams / Lip colors. I didn’t pick up the candy flavored Baby lips, firstly because I didn’t like the flavors and secondly because I thought they were overpriced!!! 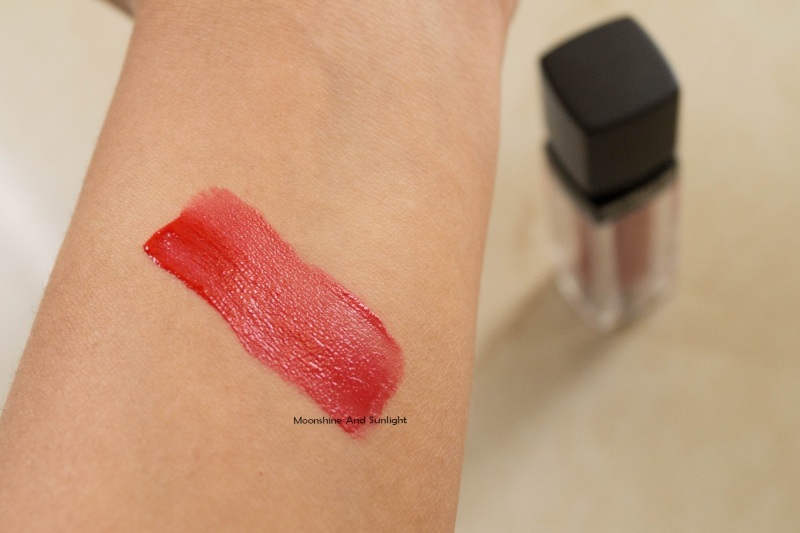 Putting the focus onto the velvet mattes now, I got myself the shade MAT 7 , which is also named Neon red (as seen on Nykaa) ,I wish they had named these first rather than numbering them. I have finally started to realize that I prefer classic colors when it comes to lipsticks and Red is always THE classic plus I wanted a red lip cream. I have been using this for over a month now, let’s see what I think of it. It is similar to the color sensational lip polishes. The only difference is that the caps are Black and matte, instead of metallic silver. 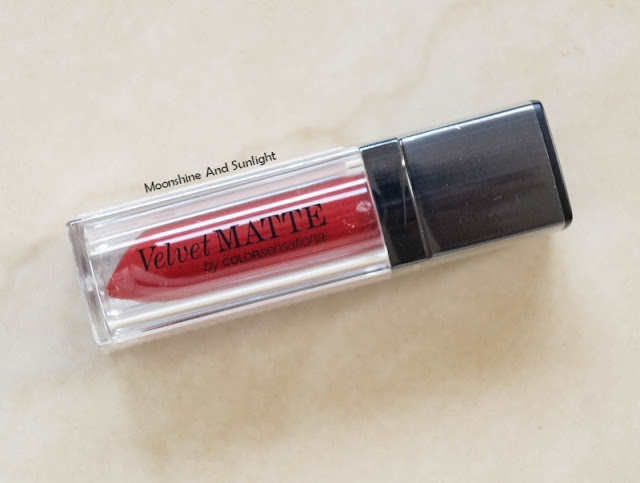 There is velvet matte written on a plastic wrap and not the body. I would have preferred it on the body. The applicator is like that of a lip gloss, a doe foot applicator and I like it because it gets the right amount of the product on it. And is very well shaped for even application. The lip stick is more of a lip cream. It is creamier than a lip gloss and applies like a creamy lipstick. 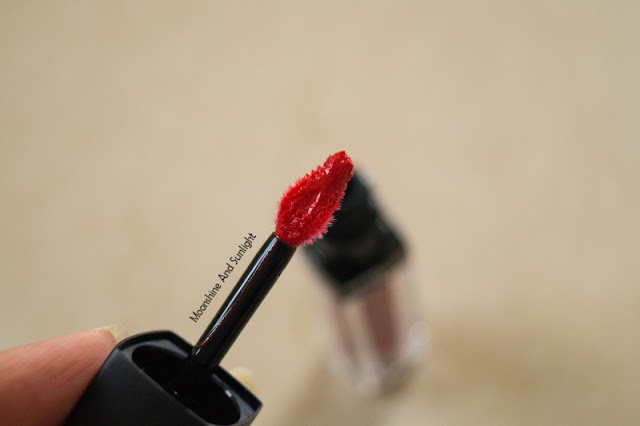 It settles like a lip stick on lips, and does not feel all sticky like a lip gloss. I LOVE THAT IT DOESN’T FEEL STICKY ! This is decently pigmented and gives a medium to full coverage. It can be build up if required. I have slight pigmentation on my upper lips and it covers it pretty well. I am wearing only one swipe of this. 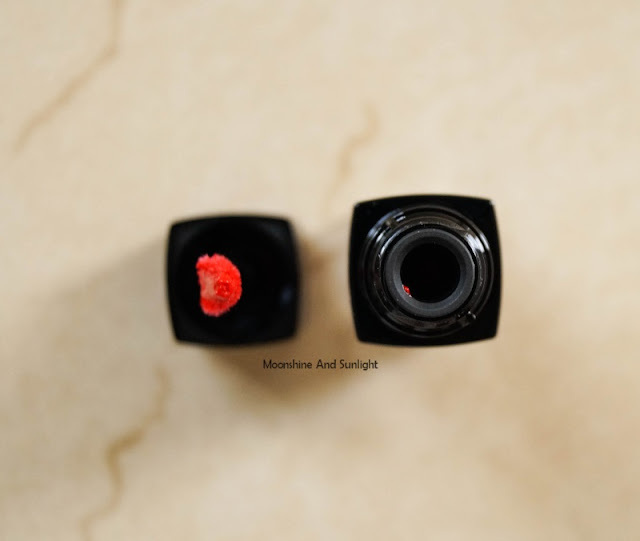 It is a bright tomato red with orange undertones. 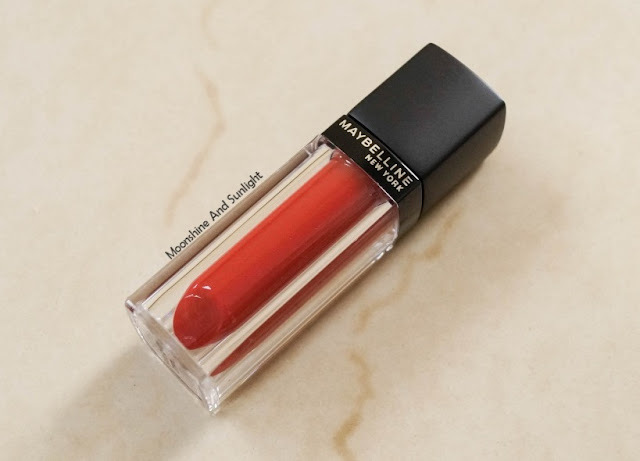 It has a glossy finish almost all the time and hardly settles to a matte lip color. It is very wearable red. Subdued and a subtle red which is pretty glam! But it is not a matte lipstick, may be a semi matte (NAHH! not even semi matte). 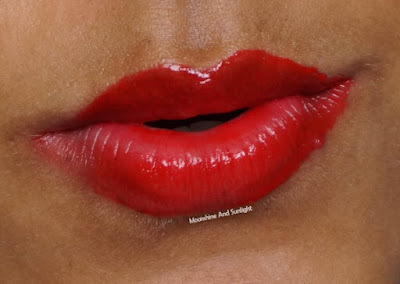 I like the creamy texture and the way it feel on my lips. It is decently pigmented as well. BUT there are TWO things that is kind of a letdown. One, It makes my lips very dry even though it doesn’t settle in like a matte lipstick. 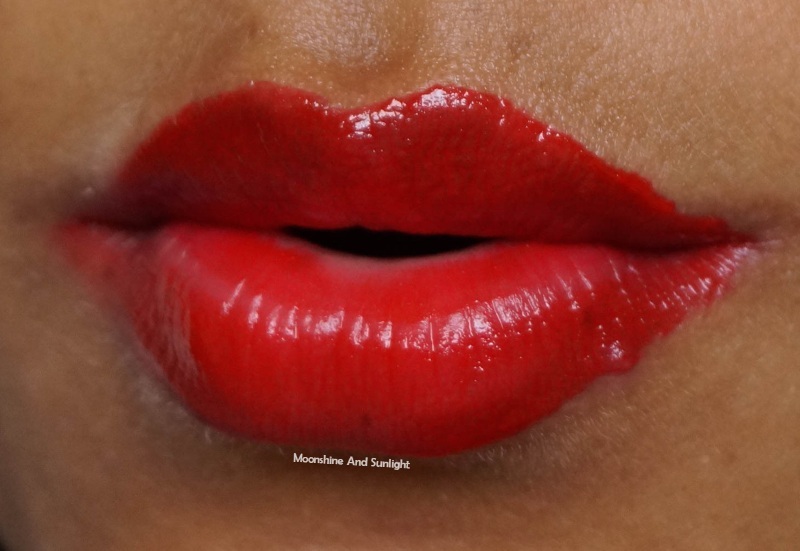 Two, It settles into fine lines of my lips and the lip color stays for 3-4 hours max. 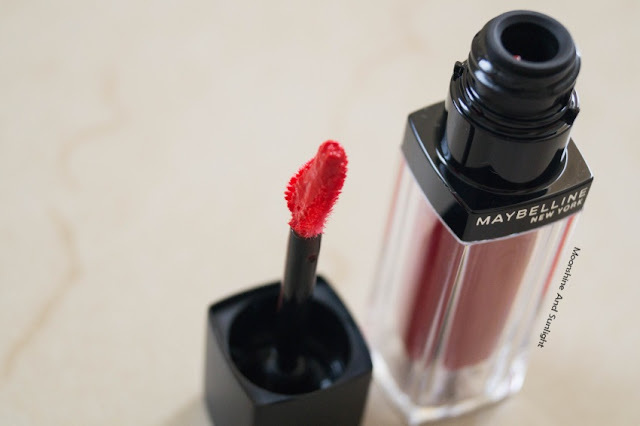 It also leaves a stain behind, but that doesn’t bother me because I kind of like lip stains, but those who don’t like that, for them this may be point number Three! 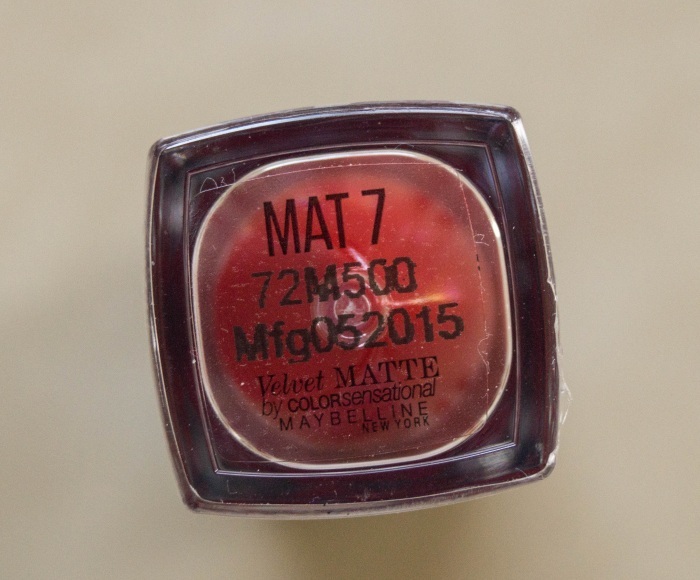 This is one of the dark shades in the range out of the 8 shades and the pigmentation is such. For lighter shades maybe it’ll be less! I still will buy another one because I like the option of colors this range has to offer and I think at this price point these are quite decent. I will give this a 7 on the must have meter! Did you buy one of these for yourself yet?? Let me know in the comments below!